When shopping for a Clawfoot Tub Faucet you can choose to order one of our many great pre-made clawfoot tub hardware packages or you can create your own! 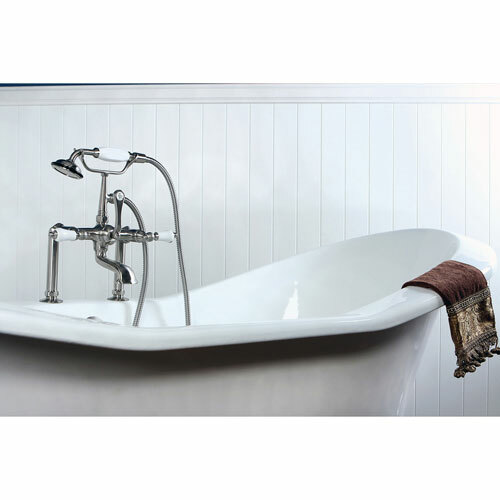 We have all the Clawfoot Tub Hardware Fixtures you need to get your tub up and running. 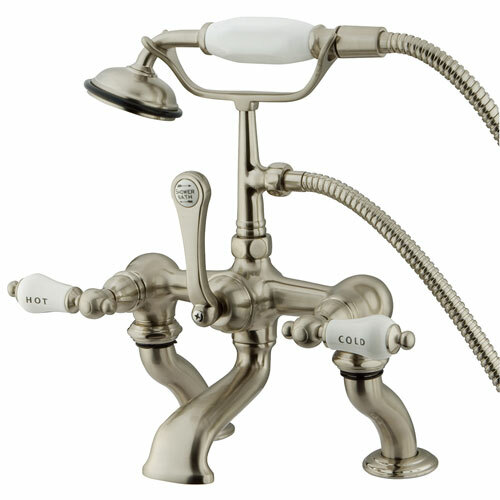 We carry Clawfoot Tub Filler Faucets, Supply lines, Supply Stops, and Drains in many great finishes and styles. The information in this guide will help you understand how to create your own custom clawfoot tub faucet kit package. Part 2 of the guide provides instruction on how to put together a clawfoot tub with a full shower enclosure package. With this information you should be able to figure out and order exactly what you need for your situation. Here at FaucetList.com we have everything you need. If this guide is in any way lacking or confusing please Contact Us with questions. We are here to help! To start, you should ask yourself a few questions. 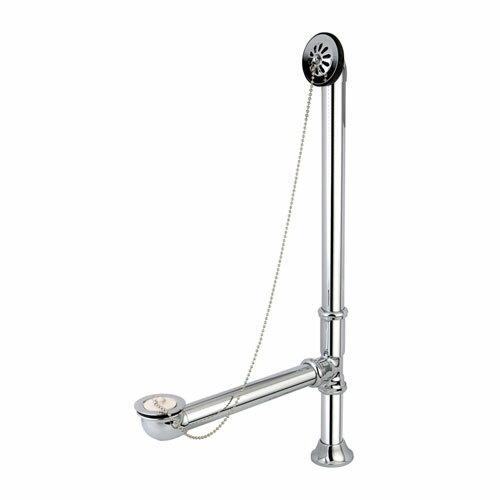 Do you want a clawfoot faucet with hand shower or without? Do you want to use your Clawfoot Tub for taking a bath only or do you also want to be able use it as your main shower? 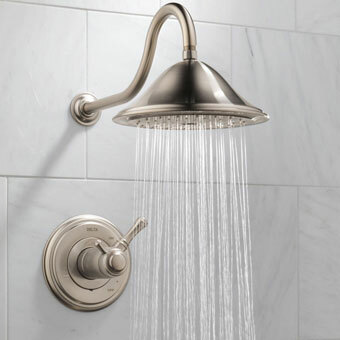 Clawfoot tub faucets that include a handheld shower are great for use while you are taking a bath but a hand sprayer alone will not work well as your main showerhead. If you want to set up a complete clawfoot tub & shower combination with shower curtain rod we can also help. 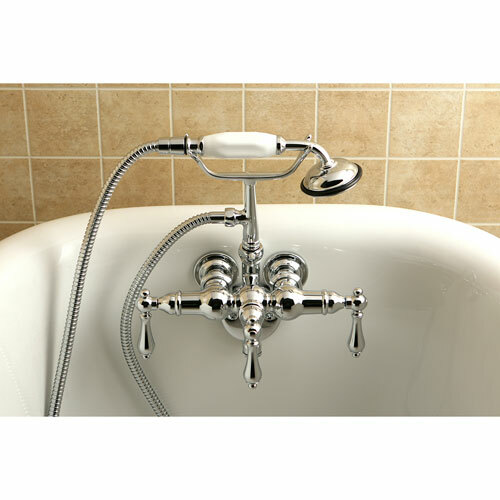 Skip to Clawfoot Tub Faucet Buying Guide Part 2. 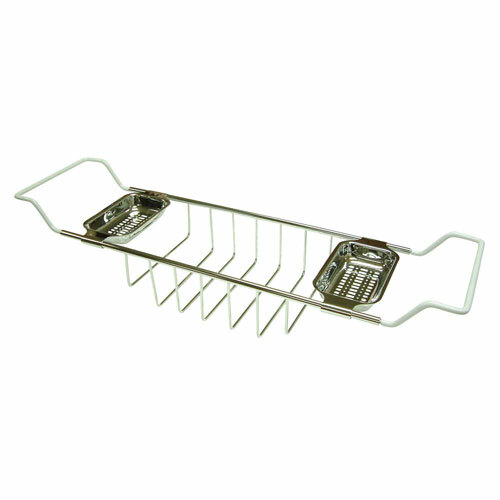 If you have a separate shower area in your bathroom and plan to use your clawfoot tub simply for taking a bath and relaxing then continue reading! For pre-configured Clawfoot Tub Filler Hardware Packages perfectly set-up for use with a Clawfoot Bathtub, take a look at our Clawfoot Tub Faucet Kits. Some options include a handheld shower spray and some do not. Some are designed to be deck mounted and others are for wall mount installation. Take a moment to browse through the pre-configured packages to get an idea of what can be accomplished. Perhaps you'll even find one that's already perfect for your tub and it will make things easy! As you read this guide you will find that setting up your own package with the exact components you prefer is simpler than you think. Remember, if you are looking to add an actual shower make sure to read part 2 for instructions on how to build the entire shower and diverter package. We have Clawfoot Tub Hardware in finishes like oil rubbed bronze, satin nickel, chrome and polished brass. Check out faucets with metal lever handles, metal cross handles, porcelain lever handles, and porcelain cross handles. 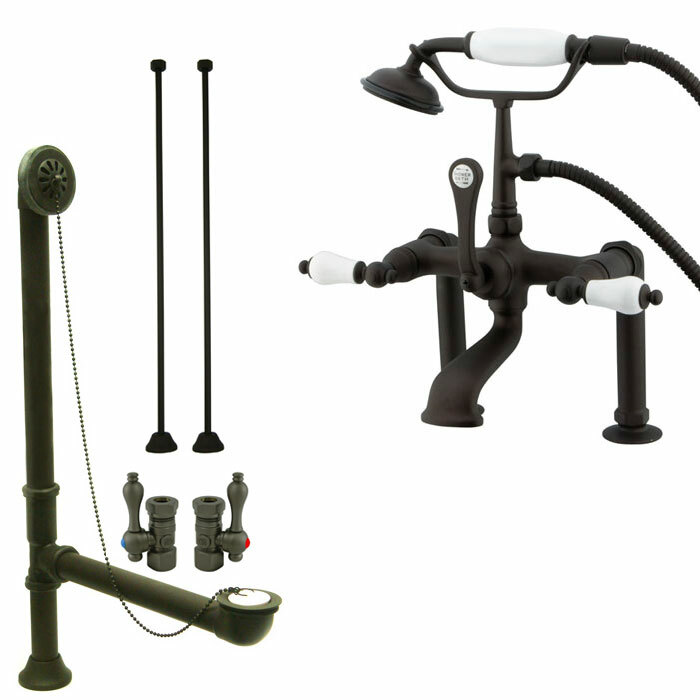 We also offer tub faucets for both wall mount and deck mount installation. Find everything you need to get your clawfoot tub up and running in no time! While supply stops are technically optional we highly recommend you install them. They are very hard to add later but during an initial installation take very little extra effort. Some other companies sell clawfoot tub faucet packages that appear less expensive but to get the price down they do not always include the stops. Our 40+ years of experience tells us that supply stops are an essential component you really should not skip if you want to do the job right. Supply stops are important if you ever have a problem and need to shut off the water to your faucet while you do repairs. They allow you to simply shut the water off to the clawfoot tub faucet only. This makes it so you do not have to shut off the water to the whole house while you wait for the plumber to fix a single fixture. Stops are a small investment that can be incredibly useful if you ever need them. Plus, you can get them in matching finishes and with matching handles so they look great! 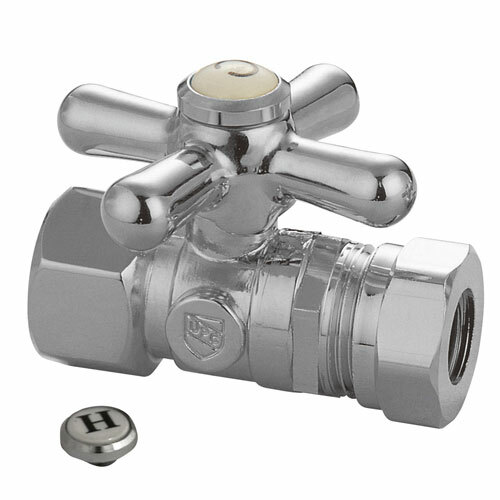 The emergency shut-off valve supply stops connect directly to the hot and cold water lines coming up from your floor. 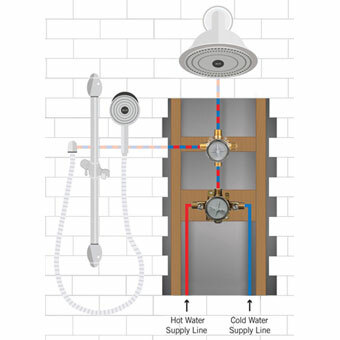 The supply stops are installed in between the hot and cold water pipes and your clawfoot tub faucet supply lines. You will need two of these supply stops, one hot and one cold. 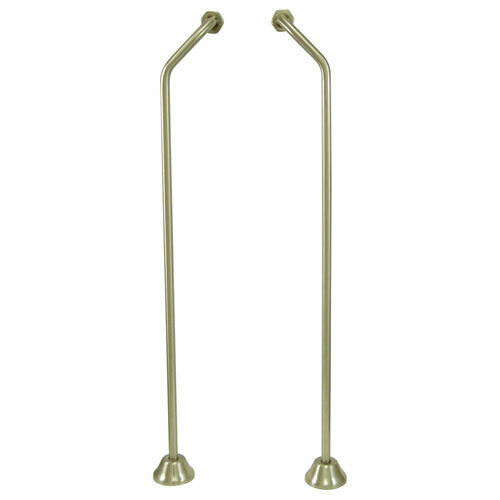 We sell clawfoot tub supply stops with both the hot and cold button. This means if it's the cold side you can use the blue indicator button and if it's the hot side you use the red indicator button. The stops themselves are identical in function. 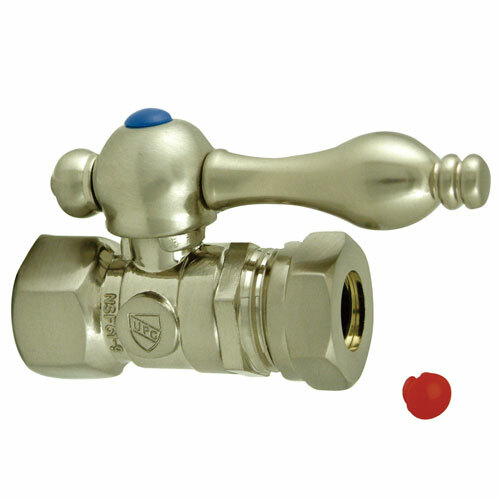 Once the stops are installed, you will need to choose your supply lines. Supply lines are sold in pairs so you will need to buy one pair. There are a few types of clawfoot tub supply lines. The type you need to order will depend on what holes are drilled in your clawfoot tub and how exactly you plan to install your faucet. All types of supply lines can be cut to fit different height requirements. If your tub is set up for a deck mount faucet you will need a set of straight supply lines. Straight supply lines run up from the floor through holes in the tub deck and into the faucet base. If your clawfoot tub is designed for a wall mount faucet you will have to purchase supply lines that come up straight from the floor but then bend at the top to direct the water into the holes in the tub wall. There are two types of wall mount faucet supply lines: single offset and double offset. The type you need is determined by how far apart your hot and cold water supply pipes are set in the ground and by how far apart the holes in your clawfoot tub are. If you have a new construction project you likely can go with either style. Double offset seem to be more common since with single offset supply lines the hardware can end up looking a bit crowded. We also carry some free standing supply lines. Freestanding supply lines are designed so you can go straight from the hot and cold water lines up and over the lip of the tub. You can install the faucet directly to the freestanding supply lines which are designed to support the weight of the faucet. Because of the exposed nature of clawfoot tub hardware, it is important that you purchase a drain finished to match your other bathroom fixtures. A clawfoot tub drain installs in between the two supply lines. The L shape of the drain fits underneath the tub to meet the bottom drain hole. The upper part is for the overflow hole at the top of your tub wall. The pipes of a clawfoot tub drain can be cut to accommodate most clawfoot tub sizes. Generally these will fit even vintage clawfoot tubs. There's not too much decision making when it comes to the drains. Just match it up with the finish of your other clawfoot tub hardware and you'll be good to go. These high quality clawfoot tub drains will be the perfect complement to your other fixtures. On to the fun part! 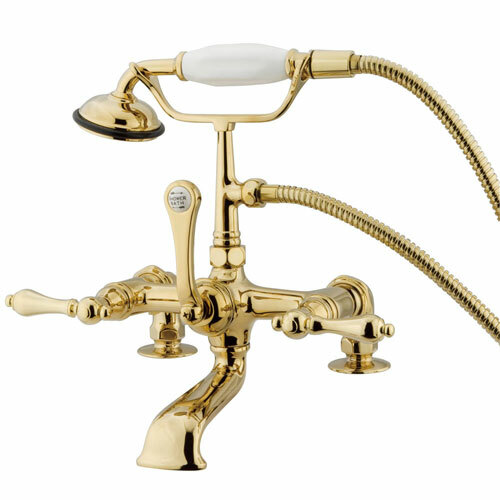 Now that you understand a bit about the hardware necessary to deal with the water issues (supply and removal), you are ready to pick out the actual clawfoot tub faucet. Our clawfoot tub faucets come in Satin Nickel, Chrome, Oil Rubbed Bronze and Polished Brass finishes. We offer many different handle options such as metal lever, metal cross, porcelain lever, and porcelain cross handle fixtures. 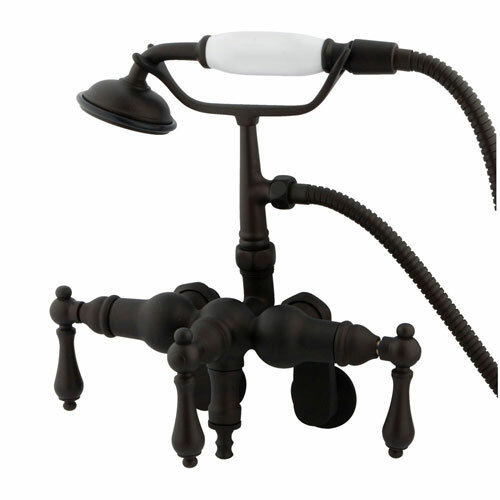 Take a look through some of our styles and you will definitely find a great Clawfoot Tub Faucet. 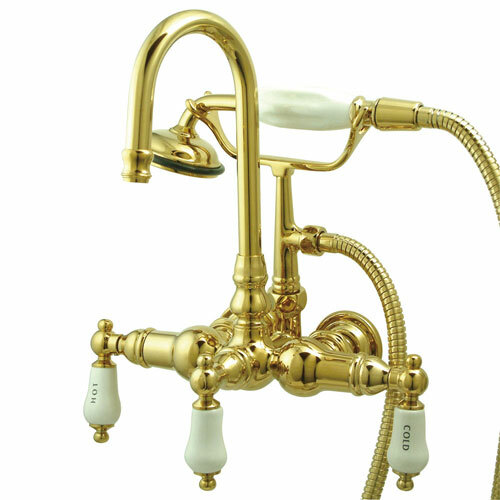 In addition to style and finish, when selecting your clawfoot tub faucet you need to consider a few other things. 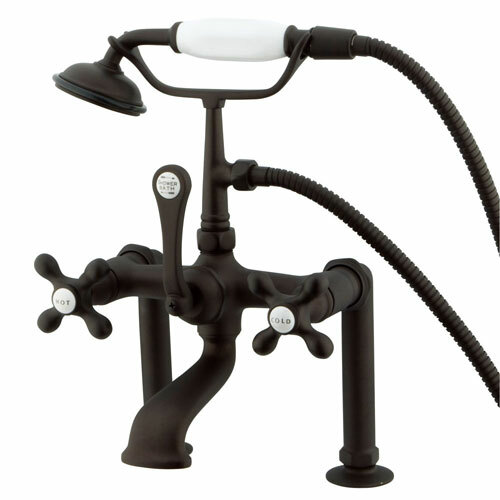 Most important is to figure out if you need a wall mount clawfoot tub faucet or a deck mount claw foot faucet. This may seem obvious to some people but just to clarify, a wall mount faucet mounts to the tub wall - NOT the actual wall. This means you should have holes in the actual tub wall somewhere near the top. The holes typically measure 3 3/8" from center to center. If you try and measure from center to center (it's a little tricky to judge where the exact center is) and come close you probably have 3 3/8". This is a standard size. If you see holes in your tub wall then they will very likely measure 3 3/8" on center. Remember our 30 day return policy is here just in case! Of course it makes everyone's life easier to just get it right the first time so if you are not sure if a faucet will fit your tub please check with us first! Shop all wall mount tub faucets. 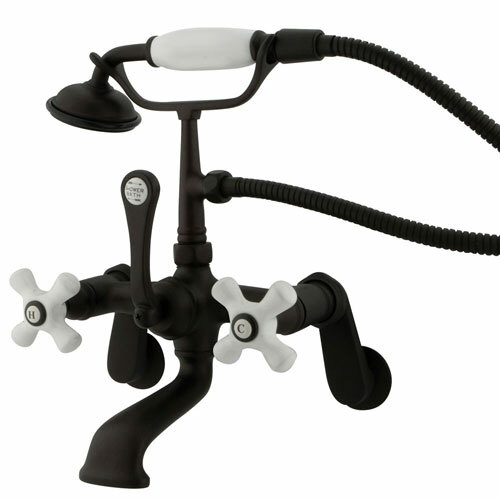 A deck mount claw foot faucet typically mounts to the lip of the clawfoot tub (if it bends over in a horizontal fashion) or to a platform (deck) near the clawfoot tub. Sometimes with a deck mount installation you don't have exposed hardware. If this is the case then nobody will ever see the drain or supply lines and you can go with a rough brass finish which will be less expensive. 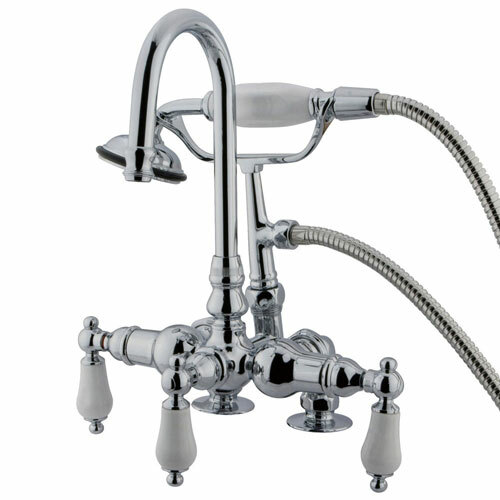 Typically however when we refer to deck mount faucets we are talking about mounting the faucet to the deck of the tub. In a normal installation all hardware is exposed so you would definitely still want to purchase the matching finish clawfoot tub hardware to go with your faucet. Most commonly clawfoot tub deck mount faucets mount into holes in the tub deck that measure 7" apart from center to center. We have many tub faucets available that fit this hole spread. Sometimes we have customers whose tubs have deck holes that measure of 3 3/8" apart from center to center. We also have faucets to fit this hole pattern. 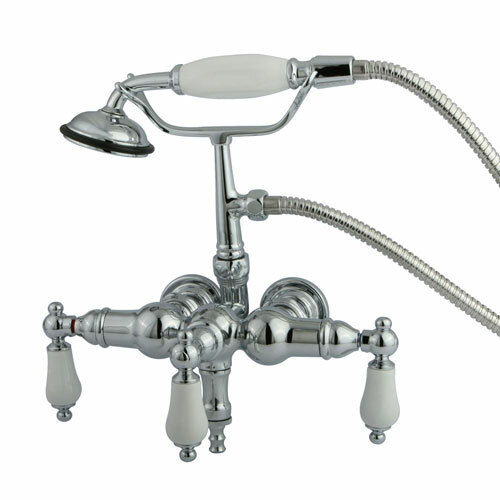 In addition, we carry many faucets with swivel elbows to accommodate vintage tubs that may not conform to any hole standard. Rather than fitting an exact measurement, faucets with swing elbows can fit a range of hole patterns and work for almost all installations. 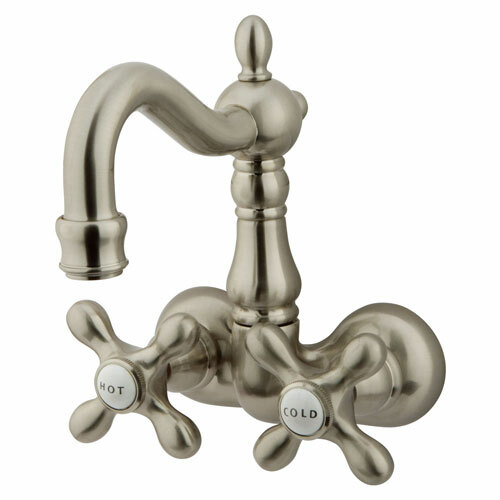 Shop now from our many great deck mount clawfoot tub filler faucets! 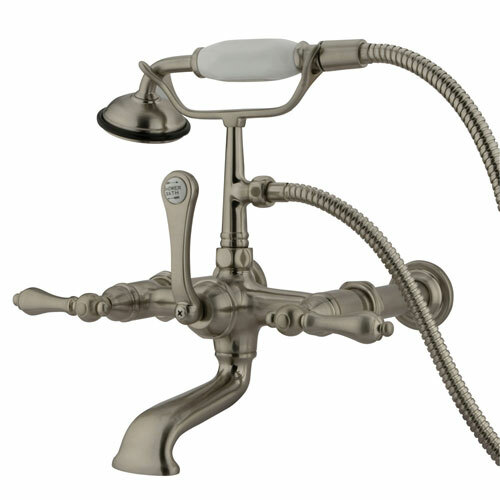 Clawfoot Tub Faucet with or without Handshower? You can also decide whether or not you want to purchase a clawfoot tub faucet with diverter and hand shower or a clawfoot tub faucet without hand shower. A handshower adds another level of functionality to your experience making washing in the tub easy! It's also great for cleaning your tub. 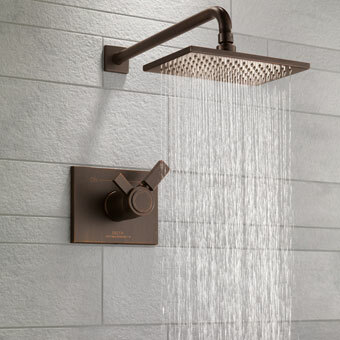 However, a hand shower is NOT a substitute for a primary showerhead as it is not really designed for that. Check out the following link if you want to have a clawfoot tub shower combination. If you purchase a clawfoot tub faucet with hand shower your tub fixture will have an extra diverter handle in the middle. Observe the image of the example fixture. 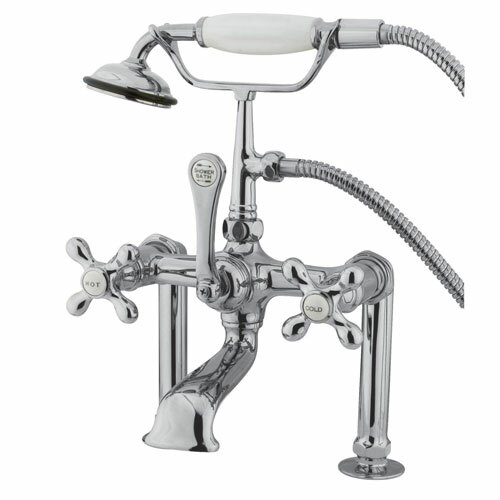 The large middle lever allows you to switch between the tub filler part and the hand shower with ease. Our items all operate with a smooth ceramic disc cartridge making the handles easy to move while at the same time keeping them 100% drip free. 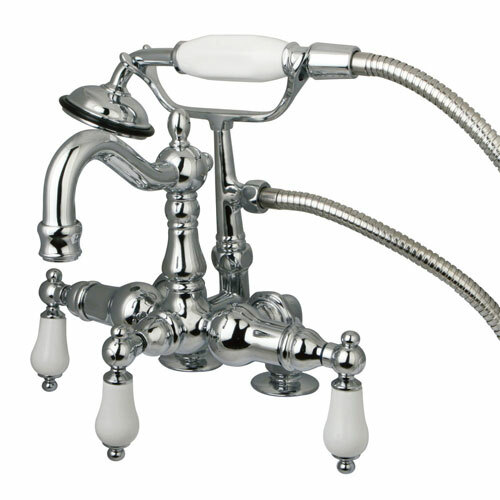 Check out some clawfoot tub faucets now! 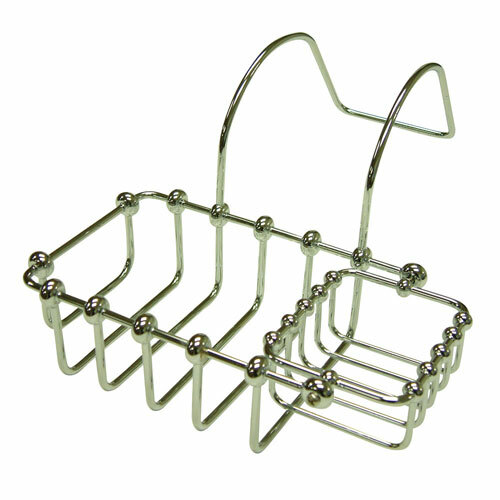 You might also want to consider a clawfoot tub soap caddy for adding that final finishing touch! 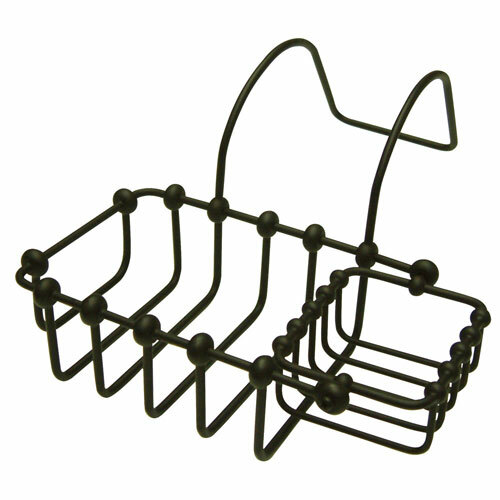 With a clawfoot tub it can be hard to decide where to keep your soap and shampoo. The floor is not a great option so unless there's a shelf nearby you may be out of luck. Luckily soap caddies are designed to solve this problem! 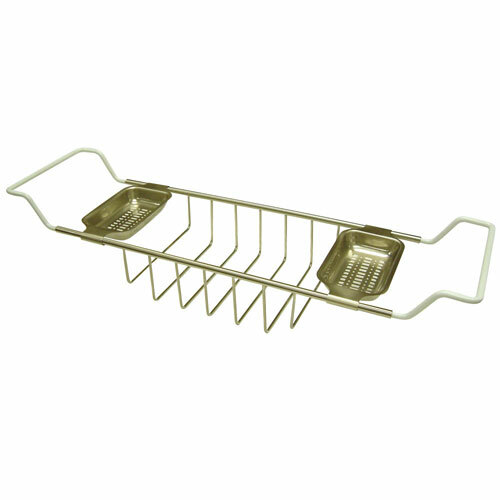 You can get a soap caddy in the same finish as your faucet so consider adding it to your order today! So you need 1 faucet, 1 drain, 1 set of supply lines, 2 stops, and maybe a soap caddy. You can check out our pre-made clawfoot tub filler package kits or go through each category linked above in the guide and build your own! If you want a clawfoot tub shower make sure to click the link below to read part 2 of our clawfoot tub faucet buying guide. 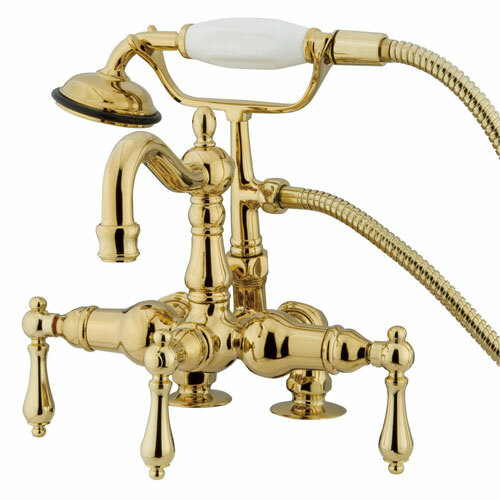 Our clawfoot tub fixtures are all super heavy brass and very well made. Join thousands of happy customers and order today!